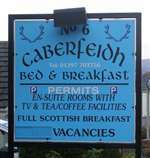 Located centrally in Fort William it is just 4 minutes walk from bus and railway stations and only 2 minutes walk from Fort William High Street. Room 1; This well appointed room has a fabulous 4 poster bed, a luxury Deluge Shower and a wall mounted flat screen TV. Room 2; Our family room, has both a double and single bed along with a spacious en-suite shower. Room 3; A triple room which has 3 single beds and an en-suite shower.